Laura and the owner of Inspirations, Stan. Although it takes me 45 minutes to drive to Sherwood Park I must say that the folks at Inspirations Book and Coffee shop make me feel like I’ve arrived home when I show up. 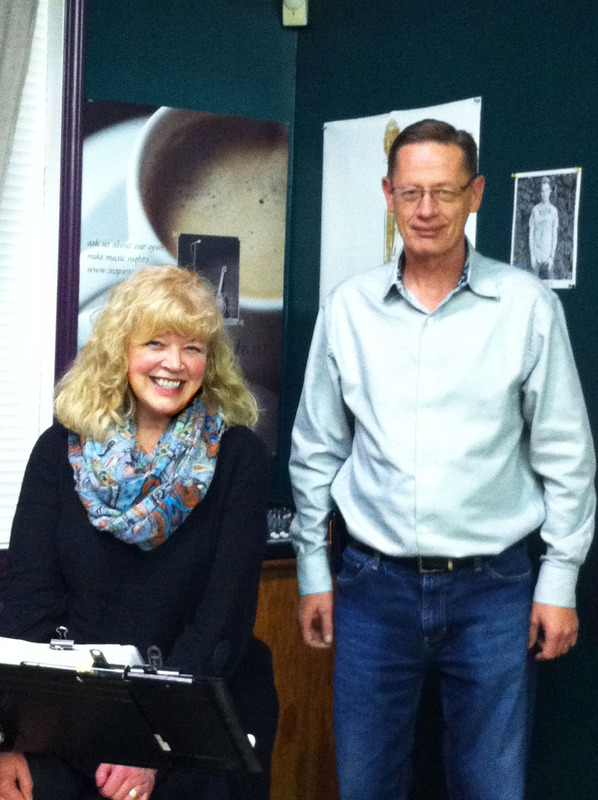 And although my musical partner, Jim, wasn’t feeling well and went home before the concert I had a wonderful time singing my tunes from 7 – 8:30 p.m. . The sound system was set up to perfection by ‘ Elvis’ and the owner, Stan, was always near by to give me a helping hand in setting up, a cup of hot tea and a treat at break …..and even applause ! Stan even purchased 6 CDs ( 3 of Waiting and 3 of Hope Is) so I feel very taken care of at the store. A lovely night where I got to meet new folks and share my newest material.